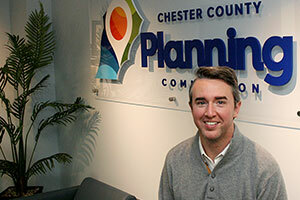 The Planning Commission welcomed a new employee in March: Transportation Planner Brian J. Donovan. Brian began working for the agency on March 26. As a transportation planner in the Transportation Services Division, Brian will coordinate with local transportation management agencies and participate in the planning for our public transportation routes, regional rail stations, and major roadway corridors. “I’m very excited for the opportunity to return to Chester County, where I spent several years growing up, and apply what I’ve learned in the planning field to this wonderful and fast-growing region,” he said. Brian previously worked as a corridor planning and long-range planning intern at the Delaware Valley Regional Planning Commission. He also was a project coordinator intern at Transportation Resource Associates, Inc., in Philadelphia. Prior to earning his master’s degree in city and regional planning from Temple University, Brian was a paralegal at a law firm for several years. Brian has a bachelor’s degree in communication from LaSalle University. Brian enjoys biking, traveling, and reading in his free time.